The spread of resistance to chloroquine (CQ) led to its withdrawal from use in most countries in sub-Saharan Africa in the 1990s. In Malawi, this withdrawal was followed by a rapid reduction in the frequency of resistance to the point where the drug is now considered to be effective once again, just nine years after its withdrawal. In this report, the polymorphisms of markers associated with CQ-resistance against Plasmodium falciparum isolates from coastal Kenya (Kilifi) were investigated, from 1993, prior to the withdrawal of CQ, to 2006, seven years after its withdrawal. Changes to those that occurred in the dihydrofolate reductase gene (dhfr) that confers resistance to the replacement drug, pyrimethamine/sulphadoxine were also compared. Mutations associated with CQ resistance, at codons 76 of pfcrt, at 86 of pfmdr1, and at codons 51, 59 and 164 of dhfr were analysed using PCR-restriction enzyme methods. In total, 406, 240 and 323 isolates were genotyped for pfcrt-76, pfmdr1-86 and dhfr, respectively. From 1993 to 2006, the frequency of the pfcrt-76 mutant significantly decreased from around 95% to 60%, while the frequency of pfmdr1-86 did not decline, remaining around 75%. Though the frequency of dhfr mutants was already high (around 80%) at the start of the study, this frequency increased to above 95% during the study period. Mutation at codon 164 of dhf r was analysed in 2006 samples, and none of them had this mutation. In accord with the study in Malawi, a reduction in resistance to CQ following official withdrawal in 1999 was found, but unlike Malawi, the decline of resistance to CQ in Kilifi was much slower. It is estimated that, at current rates of decline, it will take 13 more years for the clinical efficacy of CQ to be restored in Kilifi. In addition, CQ resistance was declining before the drug's official withdrawal, suggesting that, prior to the official ban, the use of CQ had decreased, probably due to its poor clinical effectiveness. From the 1940s up to the 1990s, chloroquine (CQ) was the mainstay of malaria therapy worldwide. The selection of Plasmodium falciparum-resistant isolates was first reported in South-East Asia and South America in the 1950s  and by the 1970s, CQ was no longer effective in these parts of the world. In Africa, CQ-resistant isolates only emerged in the 1970s. However, within 10 years, the level of resistance to CQ had risen rapidly , both in southern and eastern Africa . In 1993, Malawi was the first African country to replace CQ as the first-line treatment of uncomplicated malaria with the antifolate combination sulphadoxine/pyrimethamine (SP) [3, 4]. In 1999, Kenya also replaced CQ with SP . Other countries, such as Uganda and Tanzania followed suit soon after [6, 7]. Recent studies in Malawi have indicated that CQ resistance may revert to sensitivity within a decade of withdrawal of the drug, based on analysis of the population frequencies of the mutations known to cause or be associated with CQ resistance, pfcrt and pfmdr1 genes , and assessment of in vitro activity and in vivo efficacy of the drug [8, 9]. This reversal indicates that the pfcrt mutants may be loaded with a substantial fitness cost in the absence of drugs, thus leading to their decline in frequency once drug pressure is removed. This raises the possibility of re-introducing this safe and affordable drug for treatment of malaria in Africa . In this paper, are reported the analyses of markers associated with CQ resistance (pfcrt and pfmdr1) and the in vitro activity of CQ against P. falciparum isolates collected in an area of high transmission in coastal Kenya (Kilifi), from 1993, prior to the removal of CQ, to 2006, seven years after its withdrawal. In the same area, these changes that occurred in the dihydrofolate reductase gene (dhfr), which confers resistance to the replacement drug SP were also compared [10, 11]. A retrospective analasysis was carried out on blood samples collected from patients during several clinical trials of anti-malarial drugs conducted in Kilifi from 1993 to 2006. The 1993–2003 samples originated from several clinical trials of SP, chlorproguanil/dapsone (Lapdap™), and SP-artesunate [12–15] and were collected before drug treatment. Others were collected in 2006 from infected patients both before and after treatment in clinical trials of artemether/lumefantrine (AL)(Coartem™) versus piperaquine-dihydroartemisinin (Artekin®) [unpublished data], and amodiaquine (AQ) . No samples were collected in 1996, 2004 and 2005. Blood samples (~50 μl) were spotted onto filter paper, air-dried and stored in plastic bags with silica gel at ambient temperature. Around thirty samples were selected per year and analysed for P. falciparum mutation at codon 76 (Lys to Thr) of pfcrt (pfcrt-76) and at codon 86 (Asn to Tyr) of pfmdr1 (pfmdr1–86), and at codons 51,59 and 164 of dhfr. A subset of the 2006 samples were adapted in vitro for long-term culture and their chemosensitivity profiles to CQ were analysed. Briefly, parasite adaptation was carried out as follows: 1 ml of patient venous blood was collected and added to 5 ml of transport medium (RPMI-1640 containing 10% albumin). Parasites in this medium could be kept at 4°C for 4 days before the in vitro adaptation or cryopreserved in liquid nitrogen and adapted later. Fresh parasites were put in culture after washing the suspension with normal RPMI-1640 (centrifugation at 2500 g for 15 min); cryopreserved parasites were thawed, washed and put into in vitro culture according to standard protocols of cryopreservation . Parasitaemias were monitored until a per cycle increase in parasitaemia greater than two-fold was reached, at which point the culture was diluted by a factor >2 and if parasitaemia increased again (greater than two-fold), the culture was then considered "adapted": this process lasted two to eight weeks. Once parasites were adapted, their chemosensitivity to CQ was determined by the radioisotope incorporation method . Results were expressed as the drug concentration required for 50% inhibition of [3H] hypoxanthine incorporation into parasite nucleic acid (IC50), using regression analysis of the dose-response curve. Fifty microlitres of culture from these adapted parasites was spotted onto filter paper for DNA extraction and genotyping. Parasite genomic material from filter paper was prepared using the methanol procedure described elsewhere . The detection of single-base changes at pfcrt-76 and pfmdr1–86 was carried out using the PCR-restriction enzyme protocol described elsewhere . Point mutations in codons 51, 59 and 164 of dhfr were analysed as described elsewhere [18, 19]. The analysis of mutations at codon 164 of dhfr of samples was not carried out routinely, since previously reports showed that this mutation was not present at detectable levels in our study site and other African sites where SP resistance is high [20, 21]. However, in light of reports on the emergence of 164 dhfr mutant in Africa [22–24], the 164 codon of dhfr in isolates collected in 2006 was analysed. Mutation at codon 108 was not analysed since the presence of a mutation at codon 51 and/or 59 indicates that the parasite carries the resistant mutation at codon 108 [10, 11]. Frequencies of mutations at pfcrt-76, pfmdr1–86 and dhfr (codons 51 and 59) alleles were calculated as the proportion of samples carrying the mutant form out of the total of all samples carrying either only the mutant form or only the wild-type form: thus samples carrying both wild-type and mutant forms, in which relative frequencies could not be determined, were excluded from the denominator and numerator. In the case of dhfr, those samples with either a mutation at dhfr-51 (from the amino acid Asn to Ile) or dhfr-59 (from Cys to Arg) were denoted as 'double mutants'. Those with mutations at both dhfr-51 and dhfr-59 were denoted as 'triple mutants' and those with or without a resistant allele mutation at dhfr- 108 (Ser to Asn) were pooled and denoted as wild-type/single mutants ('WT/single mutants'). The data were first analysed by treating these as three haplotypes, and then by treating the double mutant forms as two separate alleles to give four haplotypes. with i = 1,2,3 for single/WT, double and triple mutants, respectively, and where j denotes all alleles other than i. After setting w1 = 1, Equation (2) can be solved for w2 and w3 by substituting in the observed values for p i and p j and minimizing the sum of squared differences between the observed slope i 's (i.e., those obtained by logistic regression) and their expected values, (i.e., those in Equation (2)). Note, however, that w i now depends on the frequencies of the other alleles: since these change with time, Equation (2) is an approximation . In the case of dhfr in this study, the single and double mutants changed relatively little with time and so the approximation is likely to be accurate. Confidence intervals (95%) on estimates of s were calculated by taking the upper and lower CI values of the regression estimates of the slope and then transforming them using Equation (1). Significance levels of differences between rates of decline of different alleles between different time periods, and when including vs. excluding post-treatment samples, were tested by t-tests. data from a previously published study in Malawi  were analysed in the same manner. 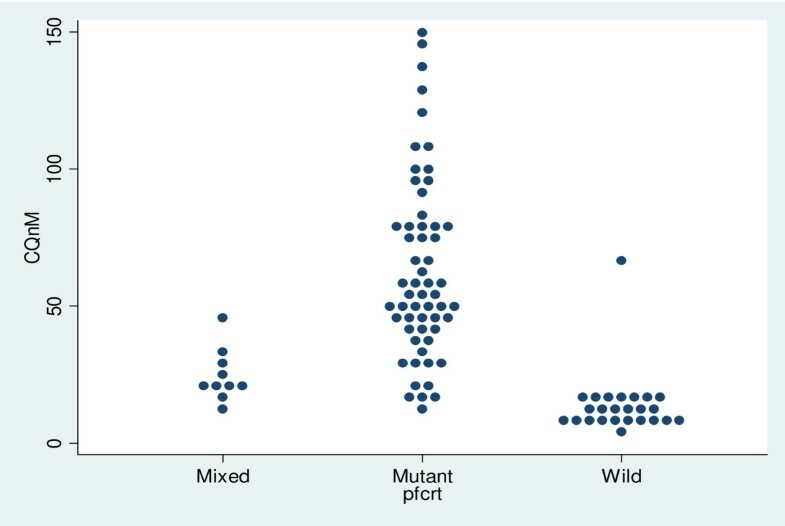 However, in that study, the frequencies of resistant mutants were calculated as the proportion of all samples with both single and mixed genotypes that carried the resistant allele, either alone or with wild-type alleles. Thus estimates of population allele frequency of the mutants in that study are over-estimates. Four hundred and six, 240 and 323 isolates were genotyped for pfcrt-76, pfmdr1–86 and dhfr, respectively, collected between 1993 and 2006 in Kilifi. Of these, 41, 28 and 58 carried mixed alleles and were not used in the analysis. Data on pfcrt genotypes from patients that had been treated with AQ (in 2006) were excluded because post-treatment patients harboured a significantly higher frequency of the pfcrt-76 mutant than pre-treatment patients (19/19 vs. 19/31, P = 0.002). There was also an indication that AL selected against the pfcrt mutant allele (frequencies of 6/8 pre-treatment vs. 2/7 post-treatment, P = 0.13). There were no significant effects of any other drugs used in the clinical trials on pfmdr-86 and dhfr allele frequencies. Nor did the inclusion of these post-treatment samples alter the slope of the regression lines in analyses of time trends in allele frequencies. Nevertheless, for the final analyses of time trends, Data from post-treatment samples were excluded. The total number of samples in these analyses was 322, 169 and 248 for pfcrt, pfmdr and dhfr, respectively, with medians of 29, 20 and 23 per year (Additional file 1). In Kilifi, the frequency of the pfcrt-76 mutant significantly decreased (P < 0.001) from around 94% to 63% over a period of 13 years (Figure 1a). This decline was occurring before the official withdrawal of CQ in 1999 (P < 0.05). There was no detectable difference in the rate of decline before and after this time (P > 0.9 by test for an interaction between the slope and time period). The estimated fitness of this resistant mutant was 5% lower than that of the wild-type (s = -0.05). In Malawi, the rate of decline after CQ was withdrawn was much faster than in Kilifi (from 85% to 13% in 9 years). The estimated fitness of the resistant mutant in the Malawi study was 12% lower than that of the wild-type (s = -0.12): this was significantly greater in magnitude than that in the Kilifi study (P < 0.001, by Student's t-test of the logistic regression slopes). Observed and fitted (by logistic regression) frequencies of pfrt-76 and pfmdr1–86 through time in Kilifi, Kenya and a study in Malawi. Observed (symbols) and predicted (lines) population frequencies through time of alleles pfcrt-76 (top panel) and pfmdr1–86 (bottom panel) involved in resistance to chloroquine in Kenya (solid line, closed symbols) and Malawi (dashed line, open symbols) before and after the official ban on the use of chloroquine (1999 and 1992, respectively). The P-value indicates whether the slope of the predicted line is significantly different from zero. The selection coefficient (s) of the resistant allele relative to the wild-type allele is shown with its 95% confidence intervals for each location. 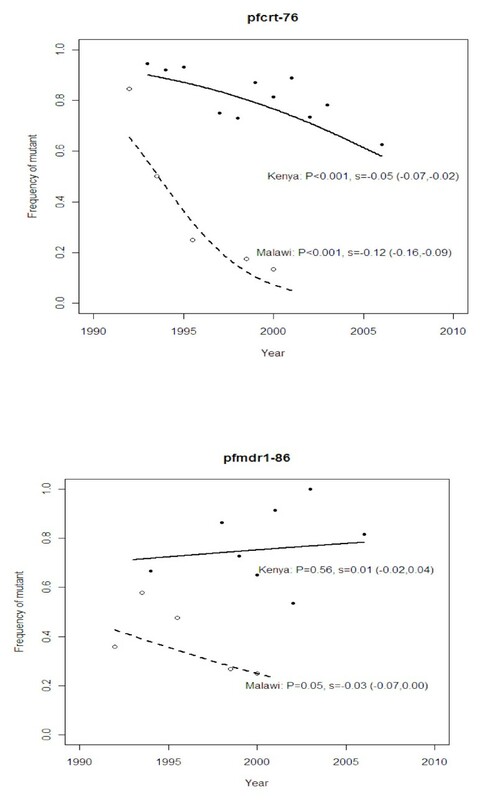 pfmdr-86 did not decline significantly (P = 0.6) in the Kilifi population (Figure 1b), and had a corresponding small selection coefficient of 1%. On the other hand, in the Malawi population, the frequency of the pfmdr1 mutant allele decreased slightly (P = 0.05) with an estimated selection coefficient of -3%. In Kilifi, the frequency of the dhfr double and triple mutants combined was already high (around 80%) at the start of the study (five years before SP became the first-line treatment for uncomplicated malaria in Kenya). Nonetheless, this frequency increased significantly (P < 0.001) to above 95% during the study period (Figure 2a). Relative to the wild-type/single mutants, the triple and double mutants combined had an estimated selection coefficient of 7%. In contrast, the change in frequency in Malawi was faster (from 15% to above 80% within nine years) with a selection coefficient of 23% for the double and triple mutants combined. This was significantly higher than that for Kilifi (P < 0.001 by Student's t-test of the regression slopes). No isolate had a mutation at 164 codon of dhfr. Observed and predicted frequencies of dhfr mutations through time in Kilifi, Kenya and a study in Malawi. Observed (symbols) and predicted (lines) population frequencies through time of alleles at the dhfr locus determining resistance to pyrimethamine, one of the partner drugs in SP. This drug officially replaced CQ as the first line drug in 1990 and 1992 in Kenya and Malawi, respectively: however, in Kenya, it was used as a second line drug prior to the change from CQ. In the upper panel, the data are for the frequency of the double and triple mutant alleles combined whereas in the lower panel, the alleles are treated separately (see Methods). Selection coefficients are expressed relative to the wild-type/single mutant genotype. Analysis of the mutant alleles separately in the Kilifi data showed that the selection coefficients of the dhfr Asn51Ile-Cyst59Arg double mutants were 5% and 7%, respectively, and 8% for the triple mutant. The frequencies of the double mutants stayed approximately the same through time because, at the same time as they were gaining ground to the wild-type/single mutant, they were losing ground to the triple mutant (Figure 2b). The values of s found here span the range of estimates from other sites in Africa and South-East Asia . The effect of including mixed infections on estimates of s was negligible. Thus the inability to detect alleles at low frequencies within a patient sample by the genotyping methods used here is unlikely to influence the results. Based on the above estimates and Equation (1), it is predicted that, if the current drug pressure were to be maintained, Kilifi isolates will have largely reverted to CQ-sensitive phenotypes (frequency of the pfcrt-76 mutant less than 10%) by the year 2023, over 20 years after the official removal of the drug in Kenya. This contrasts with the case in Malawi where this level of sensitivity was reached within nine years following CQ withdrawal. In Kilifi, virtually no change is expected in pfmdr1–86 frequency while in Malawi by 2009, the frequency of pfmdr1–86 mutant is expected to fall below 10%. CQ IC50 against laboratory reference strains V1S, W2 (pfcrt-76 mutant) and 3D7 and M24 (wild type) were analysed and and these IC50 values are 158 ± 75, 94.15 ± 16, 6.5 ± 2.3, 15.6 ± 8.6 nM respectively. The results of field isolates are summarized in Figure 3. Depending on their pfcrt-76 genotypes, parasites can be classified into three distinct groups. The first group, the wild-type group, has IC50 values ranging between 1 and 25 nM, with an average of 13 ± 12 nM. The second group is composed of mixed genotype infections (wild-type and mutant), with a mean of 24 ± 10 nM; and the third group of pfcrt-76 mutants, which forms the majority of isolates, has a mean of 63 ± 90 nM (ranging from 5 to 150 nM). To distinguish CQ-sensitive and CQ-resistant isolates, a cut-off point of 100 nM is generally used [32, 33]. However, using this cut-off point, most isolates would be classified as CQ-sensitive, yet they are pfcrt-76 mutant. Thus, the most accurate cut-off point to use in our setting would be 25 nM (Figure 3). The analysis of pfmdr1–86 genotype showed that wild-type isolates had lower CQ IC50 than mutant (57 ± 50 nM versus 68 nM+87 nM), but this difference was not statistically significant (p > 0.05). Chloroquine in vitro activity and pfcrt-76 genotype. Relationship between chloroquine inhibitory concentration that kills 50% of parasitaemia (IC50) as measured by 50% inhibition of [3H]hypoxanthine incorporation into parasite nucleic acid, and pfcrt genotype at codon 76 of isolates collected in 2006 in Kilifi. The dashed line indicates the cut-off level of 25 nM. The results show that CQ resistance in Kilifi was in decline since the early 1990s despite CQ only being officially withdrawn from Kenya in 1999  when it was replaced by SP. In Kilifi District, this replacement was effective, largely owing to an educational programme for rural drug retailers during the change-over period in 1998 to 2001, which raised the proportion of drug users that purchased adequate doses of the first-line drug over-the-counter (OTC) from 8% to 64% . Thus, following this successful training programme, CQ was largely discontinued in Kilifi, and replaced by a high usage of SP. In other sites in Kenya, however, CQ remained available at the community level as a drug for self-medication, even four years after its withdrawal . The rate of change before and after the point of official withdrawal (2001) was not detectably different (P > 0.05). These results suggest that widespread clinical failure of CQ prior to the ban drove people to use alternative drugs such as SP (which was then the second line of treatment) regardless of the prevailing official policy. This is supported by the high frequency of the dhfr double and triple mutants in the Kilifi population from the early 1990s  (Figure 2). Furthermore, prior to 2001, even though CQ was the most used anti-malarial, in most cases this drug was used at sub-therapeutic doses . Thus it seems that declining usage and low efficacy due to high rates of clinical failure led to a decline in resistance well before its official discontinuation. The fact that the frequency of the mutant allele nevertheless declined before the ban during continued use of the drug implies that there is a considerable cost of the pfcrt mutation to the parasite in the absence of drugs as even a small amount of drug pressure is sufficient to counteract quite high fitness costs . That this is the case is evident from the 12% lower relative fitness estimated for Malawi after the drug was completely withdrawn. The apparently smaller relative fitness cost of 5% in Kilifi supports our view that the drug also remained in circulation despite the ban, although we consider alternative explanations below. The frequency of the pfmdr1 mutant did not significantly decrease over time, and this could be explained by the marginal role pfmdr1 plays in CQ-resistance compared to pfcrt[36, 37]. This is supported by the results of this study showing that the pfmdr1 mutants do not have higher CQ IC50s than wild type. However, in Malawi, over few years, the frequency of pfmdr1 mutants significantly decreased, and this may be due to a rapid decline of CQ-resistance. Thus in Kenya, this may be observed when the pfcrt wild type reaches a high frequency in the population. It is well established that mutations that render an organism resistant to a drug are likely to be associated with a loss of fitness. As a result, organisms carrying these mutations will be outgrown by drug-sensitive organisms when the drug pressure is removed or reduced [38–42]. An increase in CQ in vitro activity and a decrease in prevalence of pfcrt-76 was also observed after the withdrawal of CQ in China [43, 44]. Selection of CQ resistance was associated with a loss of fitness in murine malaria, and the same phenomenon has been reported for other anti-malarial drugs, such as pyrimethamine and atovaquone in P. falciparum[45–47]. In some instances, loss of fitness may be associated with the development of compensatory mechanisms, leading to persistence of the mutant parasite in the population despite the discontinuation of the drug. This feature may explain, at least in part, the persistence of pfcrt-76 mutant in parts of South-East Asia and South America [48–50], and in Kilifi as described here, despite CQ not having been used in these areas for many years. The apparent difference between Kenya and Malawi in the rate of disappearance may also have been due to different usages rates of AQ, a close analogue to CQ. This and other studies have demonstrated that the use of AQ can select for the pfcrt-76 mutant . AQ has been the second line of treatment in Kenya since SP was introduced in 1999 and has remained so until now. This drug has partially been used in several sites in Kenya , including Kilifi, even before the withdrawal of CQ . CQ in vitro activity of Kenyan isolates collected in 2006 in this population were also tested. The data showed that the cut-off point of 100 nM  commonly used to distinguish CQ-resistant isolates from CQ-sensitive ones is not appropriate in our setting. We propose that 25 nM is a more suitable cut-off point to use in Kilifi, which is much lower than in other areas. The most likely explanation of this low cut-off point is the variability of the chemosensitivity assay in different settings due to the many factors that influence it [32, 52]. For example, here we used the CQ-resistant strains V1S and W2 and the CQ-sensitive M24 and 3D7 as controls. The observation of previous reports show that CQ IC50 against these strains are 0.7 time lower to four times higher than IC50 values we obtained, and in general, our IC50s against the CQ-resistant strains V1S and W2 were at least 1.5 time lower [32, 53–59]. Thus, whilst the in vitro chemosensitivity assay is a robust technique to discriminate between CQ-sensitive and CQ-resistant isolates within a setting, there is a need to define the cut-off point in every research setting [32, 60]. The current report demonstrates that CQ-resistance has been decreasing in Kilifi since its withdrawal in 1999, but that this decline was much slower than in Malawi. It will take 13 more years for the clinical efficacy of CQ to be restored in Kilifi. The most likely reason for this difference is that the change of drug policy from CQ to SP in Malawi was swift and effective, such that SP became the only available anti-malarial drug for treatment within one year of implementaiton. In Kenya, it appears that the ban was both too late and was ineffectively applied, so that it gave rise to the use of other drugs such as AQ, as well as continued use of CQ, thereby maintaining selection for CQ resistance. Thus, while the highly efficient implementation of drug policy in Malawi that permitted a faster reversal of CQ resistance also promoted more rapid selection for resistance against the replacement drug, SP, than in Kenya, the less rigorous enforcement of drug policy in Kenya has resulted in both the high maintenance of CQ resistance as well as high SP resistance. Thus the effectiveness of drug policy implementation can have important and far-reaching effects on the useful life of life-saving drugs. The newer policies of using drugs in combinations in order to prolong the resistance-free period is a good example of this [28, 61]. Leah Mwai, Edwin Ochong contributed equally to this work. We thank the director of the Kenya Medical Research Institute for permission to publish these data. This study was supported by the National Institute of Health of the USA (NIH Fogarty International grant TW 01186), the European Developing Countries Clinical Trials Partnership (EDCTP), and the KEMRI/Wellcome Trust Programme (WT077092). AN is an EDCTP senior fellow and LM is an EDCPT PhD-funded student. SB is funded through a Junior Group grant (SFB544, A7) by the Deutsche Forschungsgemeinschaft (DFG). LM carried out parasite adaptation, drug chemo-sensitivity assays and genetic analysis. EO contributed in the genotyping of pfcrt, pfmdr1 and dhfr genes. AA and SM contributed in the in-vitro culture and drug sensitivity assays. SW, GK, KM and AN designed the study and were involved in manuscript development. PS and SB contributed in generating isolates that were used for the assessment of CQ activity. MM carried out statistical analyses, and contributing in manuscript development.